a small, soft-coated terrier, distinguished by its Roman nose and roached back which are accentuated by trimming and grooming for purposes of showing. Originally used for hunting small game, dog fighting and racing. The breed is subject to inherited retinal dysplasia and copper-associated hepatopathy. an inherited copper storage disease in which Bedlington terriers homozygous for the trait accumulate copper in their liver and suffer a slowly progressive hepatopathy. Clinical signs referable to liver disease develop in young to older adult dogs. The disease is incurable, but may be managed with d-penicillamine or other decoppering agents. 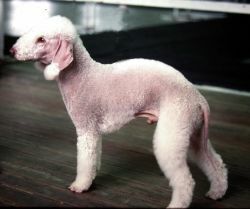 Called also Bedlington terrier liver disease. see Bedlington terrier copper-associated hepatopathy (above). She eats, sleeps and lives a life of luxury," added Craig, who had three of his Bedlington terriers at Crufts this year. Now Mr Rich is hoping that same international interest will propel the Bedlington Terriers to worldwide stardom with all sales going back to help the Terriers. That would have been the end of Bedlington Terriers. Ties involving Northern League clubs are: Ashington v Nelson Heaton Stannington v West Auckland Town Easington Colliery v Northallerton Town West Allotment Celtic v Consett Shildon v Bedlington Terriers Seaham Red Star v Morpeth Town Thornaby v Bishop Auckland Liversedge v Guisborough Town North Shields v Jarrow Roofing BCA Newcastle Benfield v Thackley Whitley Bay v Norton and Stockton Ancients Chester-le-Street Town v Garforth Town Sunderland Ryhope CW v Pickering Town Padiham v Team Northumbria Marske United v South Shields Penrith v Sunderland RCA Washington v Newton Aycliffe Durham City v Billingham Synthonia Barnoldswick Town v Dunston UTS The preliminary round is on Saturday, August 20 and the first round qualifying is on Saturday, September 3. Bedlington Terriers and Durham City, who are equal on points, occupy the other two relegation places and have a lot to do if they are to survive. LEAMINGTON striker Richard Adams looks certain to be fit to face Bedlington Terriers as Jason Cadden's boys look to clinch a place in the last 32 of the FA Vase for the second year running. BRILLIANT Bedlington Terriers took their place in the second round of the FA Cup after tearing their Nationwide League rivals to shreds. 45pm unless stated) UEFA Champions League First Knock-Out Round First Leg : Gent v Wolfsburg, Roma v Real Madrid FA Vase Fifth Round Replay: Bowers & Pitsea v Ipswich Wanderers Evo-Stik Premier Division: Whitby v Ashton Utd Ebac Northern League Division One: Bishop Auckland v Bedlington Terriers (7. BEDLINGTON Terriers, who until recently propped up the Ebac Northern League First Division, are now third-from-bottom following last night's victory over Jarrow Roofing. BILLINGHAM Synthonia take on Bedlington Terriers tonight looking for a good display to send them bubbling into Monday's Durham Cup final (KO 7. Blake sealed the impressive victory midway through the second period with a clinical finish from Rich Adams's lay-off and Brakes now entertain 1999 Vase finalists Bedlington Terriers on December 6. 1 Hippolyte 47 Zaliukas 49 HT 0-0; Att 4,345 Ebac Northern League Division One Crook Town 0, Celtic Nation 0; Morpeth Town 0, Shildon 0; North Shields 4, Bedlington Terriers 0.